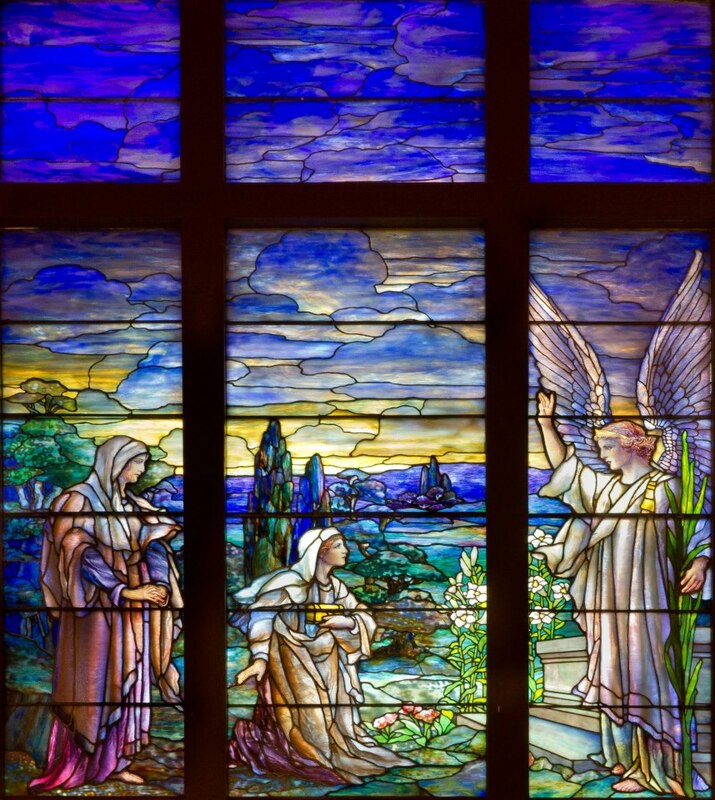 The adjoining sanctuary and chapel areas of Peace Memorial Presbyterian Church are home to a beautiful collection of stained glass windows, including two designed and signed by glass designer Louis Comfort Tiffany. The church sanctuary windows were installed when the church was erected in the early 1920's as a thank offering to God for the end of the First World War and in honor of the Prince of Peace. From this offering come the roots of the church's name "Peace Memorial". Throughout the sanctuary and chapel areas, there are four large picture windows, twenty-four small windows and five pairs of French doors. The remodeling of the Peace Memorial Presbyterian Church in 1956, opened a chapel into the main body of the church. This chapel offered the possibility of using two tiers of windows and three pairs of French doors for stained glass. It was decided the Session of the Church to undertake the selection of windows for the chapel area that would be in form and color scheme in keeping with the windows in the original church itself. The J. and R. Lamb Studios of Tenafly, New Jersey, were the artists and craftsmen chosen for the design and installation of the glass. With the general outline in mind, the windows were offered to members and friends of the congregation as suitable memorials and gifts for the church. All of these windows were installed during the period concluding with Easter, 1959, and make a fitting completion of the symbolism in this portion of the church. The windows installed comprise a large picture window area in the south wall of the chapel, and windows that extend to the east and west. There are two series -- the first story windows outlining symbols in the life of Christ, and the Clerestory windows outlining the Books of the Bible. In addition, the French doors on the east side symbolize various service organizations and entitled, "Doors of Service."